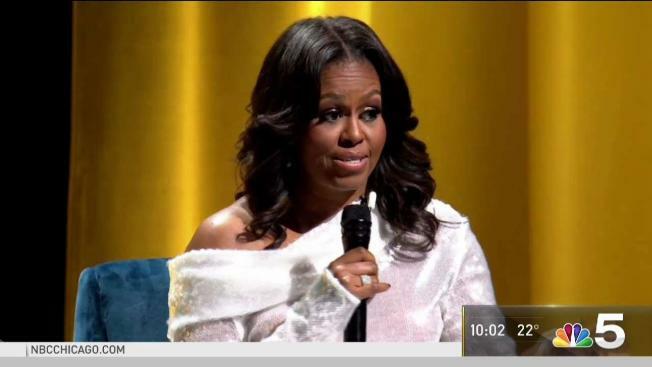 Oprah Winfrey is among a series of big names appearing as special guests as Michelle Obama goes on tour for her memoir, "Becoming"
Two powerhouses, Michelle Obama and Oprah Winfrey, joined forces Tuesday night at the United Center for an intimate conversation as the former first lady kicked off her 12-stop book tour. Guests heard from the former first lady about her secrets from before, during and inside the White House. Thousands of excited guests joined talk show queen Winfrey in welcoming Obama for the launch of the tour. Her memoir, "Becoming," describes Obama's upbringing on Chicago's South Side, as well as her time at Whitney Young and Princeton University. Obama's anecdote about coming back to town drew cheers from the crowd. "I see my high school, I think that's mom's house," Obama said. "I still call it the Sears Tower--I don't know what the name is now. You know, I try to trace the outlines of my city and find all the neighborhoods." Winfrey praised Obama's new book. "From the first page to the last, you did it, you brought it," she said. "You opened yourself up, you allowed us to see in and let us experience the fullness of you in a way that I don't think anyone has ever done before--particularly anybody who's been in the White House." Winfrey is among a series of big names appearing as special guests when Obama goes on tour for her memoir. Others appearing with the former first lady will include Reese Witherspoon, Sarah Jessica Parker, Michele Norris and former White House aide Valerie Jarrett. In "Becoming," Obama shares such deeply personal revelations as suffering a miscarriage and sharply criticizes President Donald Trump for promoting the false "birther" rumor that Barack Obama was not a U.S. citizen. The former first lady's book comes out Tuesday and is among the most anticipated political memoirs in years, topping Amazon.com's best-seller list throughout the weekend.